And people are still trying to figure out what it is exactly. Following yesterday's teases, Undertale creator Toby Fox has released a free game on a website called Deltarune that you can download right now. 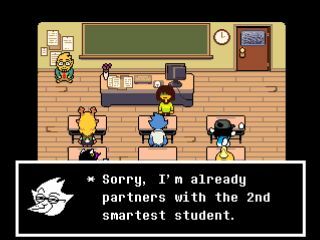 As pointed out by numerous users on Twitter, Deltarune is an anagram of Undertale—and when you get past the initial, creepy two-minute intro, you get into something that looks familiarly Undertale-y. Well, looking at Twitter, we might be a bit late for that one. We'll update this post when we know more about what the hell is going on.